As I drove toward the mountain I heard a loud chorus of angels singing.It was as if they were rejoicing and celebrating something. It got louderand louder as I walked around the town, then I heard a voice say, "Cometo the mountain at noon tomorrow." It was very clear and real. What didall this mean? 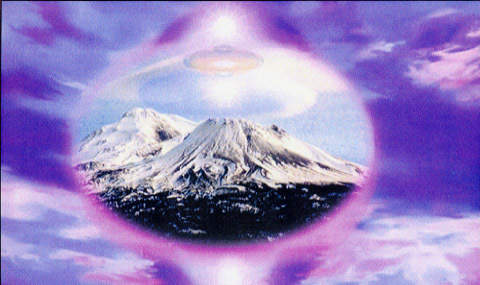 Thatmorning I had picked up a tape from Joanna Cherry's office (Ascension MasteryInternational) about how to bilocate into the ascended masters retreatin Mount Shasta, so I figured that was what this message was about; coincidence? At noon the next day I played the guided meditation tape, and this is whathappened. smiledand gave me a warm hug. A glow came over me of pure love. I saw myselfin my lightbody, dressed in a long flowing robe with a high priestess moonstoneand rose quartz crystal placed on my third eye. I also had rings on mytoes. He then led me by the hand into a huge chamber, where there was a circularplatform and a giant chair, almost like a golden throne. He said, "Come,child, sit in the chair." It was an acceleration chair, where your bodyfrequencies speed up and rejuvenate. I took off at the speed of light.I felt myself going up through the mountain and out the top. The sky wasdark and full of stars. I then went for a ride around the universe andsaw the galaxies and stars. When I came back I found myself in the chairagain. Babaji led me by the hand to a golden waterfall. I stepped intothe pool naked, and this gorgeous, friendly pink dolphin greeted me witha smile, whisking me for a ride through the caverns and into a crystalcave, where there were four young women. They communicated telepathicallyand placed a crystal in my lower back shaped like a pointed, coiled arrow.They told me this was to open my writing skills. I was then taken into a lush, jungle-like setting, with wild animals roamingaround. I found myself next on a beach that led to a cave where an ancient,powerful man stood with long white hair and a flowing beard. He was fullof compassion, his aura was glowing. "You must teach ascension to people.It is very important," he said. His face looked familiar, but I could notplace him. When my awareness came back into my body, I realized that he was my oldfriend and teacher, the immortal Melchizedek! I wonder what will happen next time I visit Mt. Shasta.